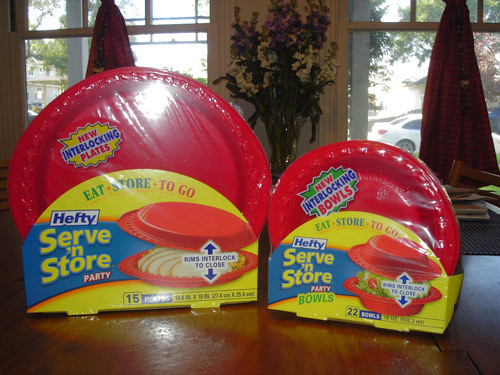 A while ago (ok, it was five months ago) I received an email from a marketing guy asking if I wanted to review Hefty Serve â€˜n Store stuff for my site. Now I know that marketers are getting saavy to blogs and that this was basically a product pitch, but I thought it would be fun. 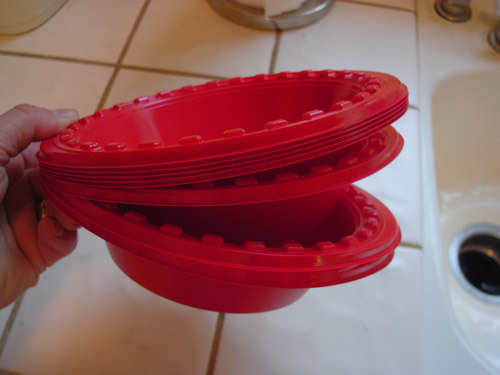 So, let it be known that I received TWO PACKAGES of plastic bowls for FREE. No hidden astroturfing here at Cruft Labs. Due to little things like work, my family, World of Warcraft and my general laziness, it has taken me quite a while to do the review that you, the Loyal Cruft Reader, would expect. The Serve 'n Store bowls and plates are a kinda intriguing concept. The idea is that the edges can interlock and close up to form a container. So you eat off a plate, don't finish it, and with the leftovers, you slap a second one on top and toss it in the fridge. Sounds reasonable. The first thing I had to check was if it was water tight or not. I filled the bowl up with water, seal the lid and turned it on it's side. Water poured out. 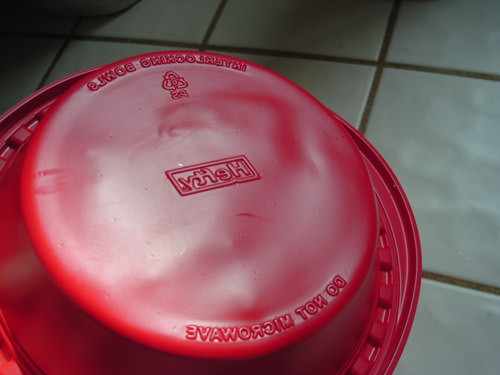 It held food just fine, but it should not be used for liquids if you are used to Tupperware or other water tight containers. 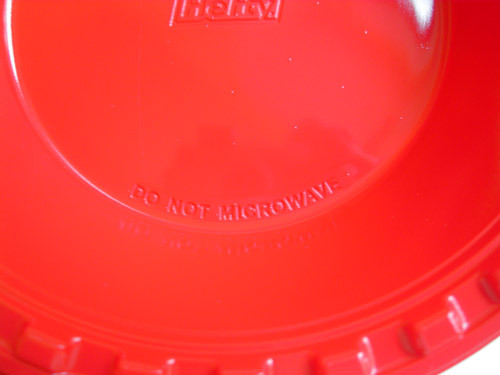 As I took a closer look at the bowls, I was surprised to see the words "Do Not Microwave" on the bottom. At first this didn't make sense until I condsider that if the closed set was put into the microwave, the steam of the food cooking inside, could cause the bowls to blow open in a messy way. Of course, the only way to know was to test the bowls out in a real test. So I placed some chicken leftovers in the bowl and popped it into the microwave for a few minutes. Everything came out of the microwave fine and I had a nice buffalo chickens andwich and a beer. After eating, I took a look at the bowl and noticed that it had indeed deformed slightly from it's brief time in the microwave. My recommendation is that one reheat will be fine but more than that will wreck the bowls further. Of course, Hefty's lawyers are wigging out that someone would disobey the clear instruction "Do Not Microwave", but I'm a rebel. Now on to more crucial tests. 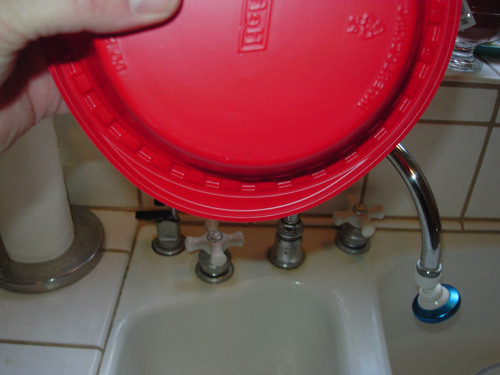 Once of the key roles that paper plates fufill is as makeshift frisbees. 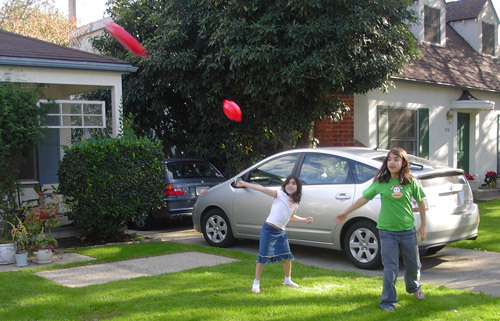 I took the girls outside and had them try throwing the sealed plates. They flew surprisingly well. The girls had fun with them and I guess that's all that matters. The second critical test was whether the Server 'n Store could be used as maracas. Anyone that has participated in children's crafts knows the way to make a maraca is to put some pinto beans in some paper plates and then staple the edges shut. It made sense that the sealing action of the bowls would make them perfect for the test, but a real test was in order. As you can see, they passed this test with flying colors. Overall, the Serve 'n Store stuff works as advertised. We'll probably keep some around the house from now on, but I think they should offer a microwave safe version to placate the worryworts out there. Hah. I was also asked to review their product. In an inept way. As it happens, months went by and no item. So the PR wag followed up to see if I liked the product, and I let him no I hadn't received it. And he promised to send me one. It never came. Months and months later I get another email from the PR people asking if I'd review yet another product, I declined, since they had taken up so much of my time and never delivered. And then they rushed out and sent the first product. I couldn't really be bothered to review it after all the hassle and lameness of it, but glad to see you are sticking to your agreement! 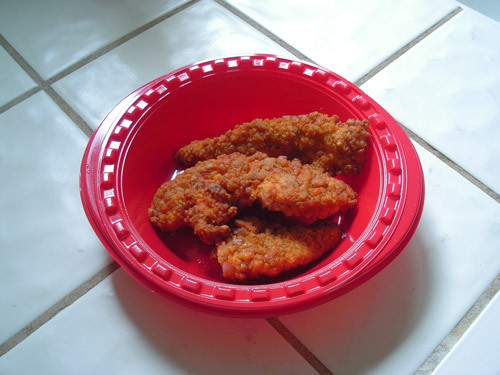 They worked well for bringing leftovers home from your house when you first got them. In order to be good to the planet, i washed them and kept them for reuse in the future. But Please Mikey, listen to your Mom here. Don't put such things in the microwave. It isn't just that the plastic melts or warps. The food inside is no longer fit for consumption! wow. you used a tripod! nice work! Nice nice. What did you use to generate that Flash video player? Wow, look at Mira's perfectly aimed arm in that picture! If I ever go frisbee golfing, I want Mira on my team!! !